The catchpool, or catch-pond, was a large, open cesspit located in today's West Hendford close to the junction with Beer Street (long before Beer Street was built). It was shown on E Watts' maps of 1806, 1831 and 1842 and in 1835 the Town Commissioners referred to it in their Minutes "Horses Lane from entrance opposite Three Choughs to Catchpool and thence to Hendford Bridge". In 1852 Mr Etheridge gave evidence at the General Board of Health's investigation into the state of public health affairs in Yeovil "There was formerly a catch-pond at the bottom of Horsey's Lane, which was used for securing the deposit of sewage. About two years since, some gentlemen speculated and enclosed this catchpond with a wall so as to serve the whole of the sewage, liquid as well as solid, and erected a pump to raise it into carts, in order to sell it to to any parties desirous of purchasing it. The speculation did not answer however, and the catchpond was covered up as a nuisance and abolished by agreement." 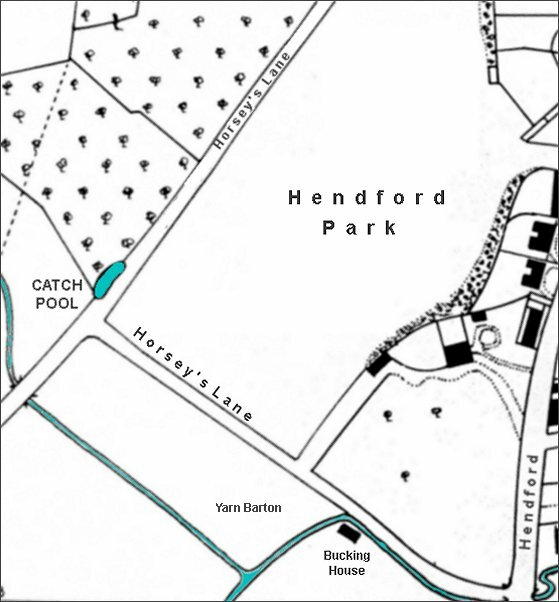 Map based on Watt's map of 1831 showing the catchpool close to the junction of today's West Hendford and Horsey Lane although, at the time, both were known as Horsey's Lane.